With 2017 right around the corner, we want to better equip your church by making our church planting, multisite, and leadership courses even more affordable. So we are happy to announce NewChurches.com Rewards, a simple program to make it easier to get the resources you need to multiply your mission. Simply put, for every dollar you spend at NewChurches.com, you’ll earn 10% cash back to use on our online courses. 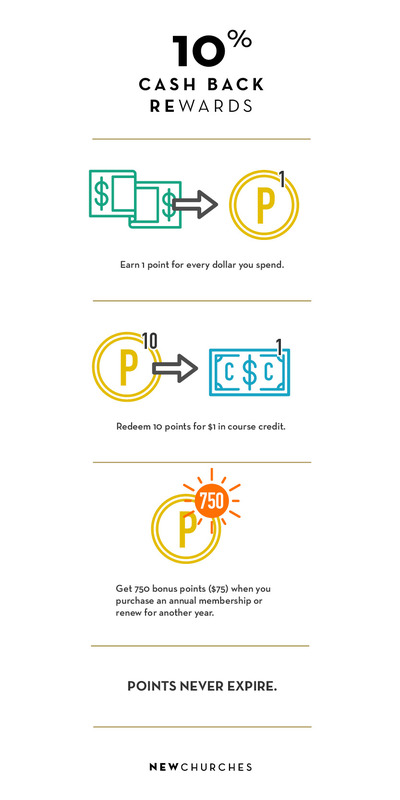 Redeem 10 points for $1 in credit towards any of our courses. Get a 750-point bonus ($75) when you purchase an annual membership or renew an existing membership for another year. Points never expire (unlike your airline miles). Your membership options for NewChurches.com remain the same as they were prior to the points program. And there are no new obligations or terms of membership (though Annual Plus Members do get an extra $75 back when they sign up or renew!). We just want to add value to your experience with NewChurches.com and make it easier to purchase our online courses. If you’ve got questions, please let us know. We hope this is just one more way NewChurches.com can help you multiply your mission of making disciples.